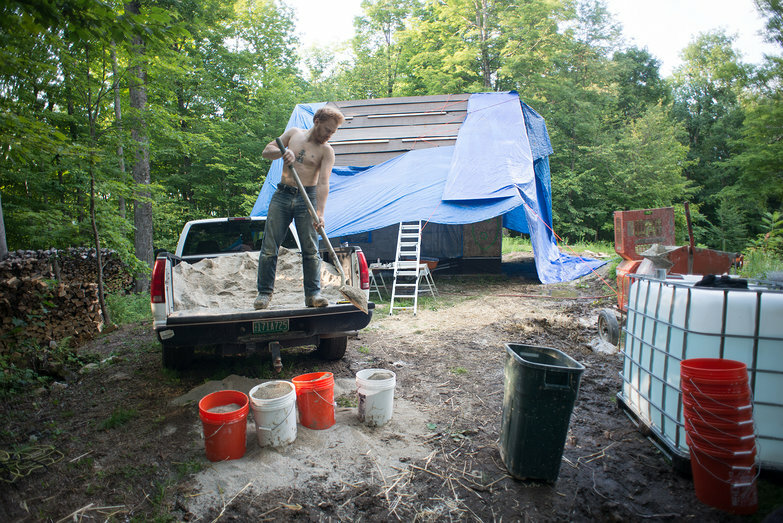 Homesteading and Self Reliant Living: For Better or For Worse: Plastering Begins! 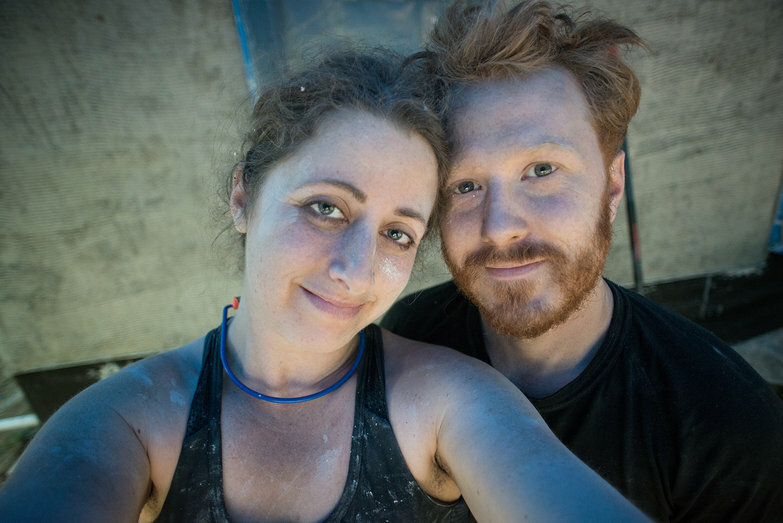 For Better or For Worse: Plastering Begins! 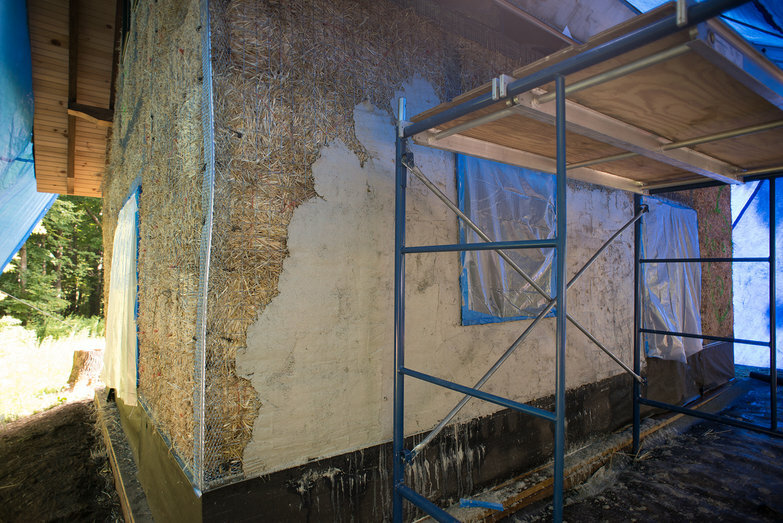 Our entire home-building process has been full of unknowns and steep learning curves, but the plastering part of it has loomed largest and most daunting of all. 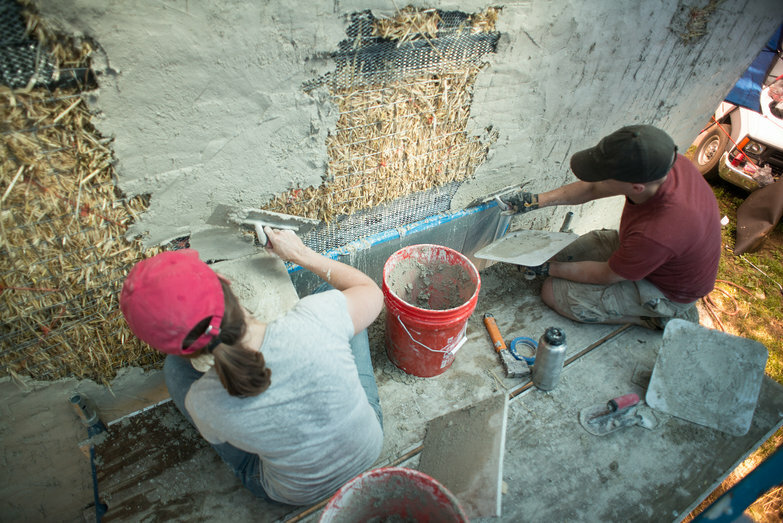 While everything about our project feels vitally important, the plaster is most critical. If we mess it up, it will crack and fall off and our bales will get wet and they will rot away and our house will fall apart and we'll have to re-build it and I will die of exhaustion and despondency and straw bale sneezes. There are so, so many ways to fail. Though absolutely terrified, we've done our best to prepare. I've watched Andrew Morrison's plastering video multiple times, and I've had long chats with the company we bought the plaster from. I've ordered our plastering tools, and they've been sitting in the workshop waiting for this moment to come. Now, the day of reckoning has arrived. Any mistakes we've made will be covered. Any stupid holes in the bale walls that aren't stuffed with enough straw will be filled. Our chance to alter the exterior of our house will be over. For better or worse, plastering begins today. 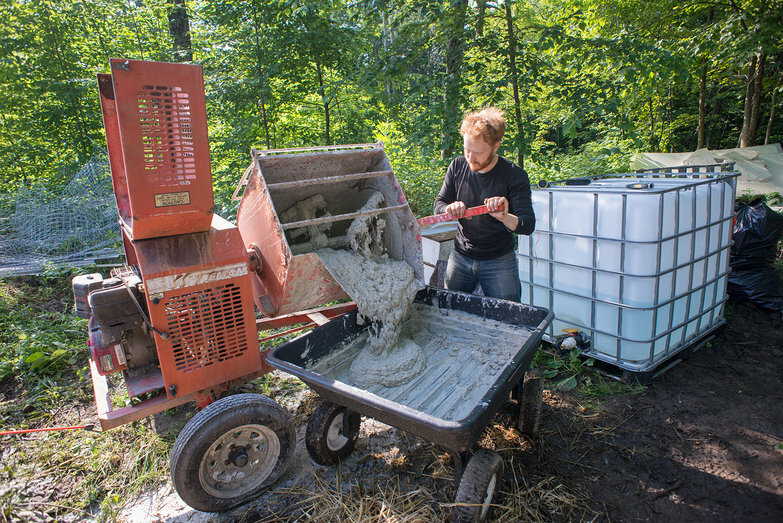 Into the roaring, coughing mortar mixer goes the sand, along with a little water. Lord help us. "More water!" Tyler shouts over the din of the mortar mixer and the mondo generator we purchased for this day (so we'd be able to use our well's submersible pump.) I fill a bucket a few inches, and toss it in. 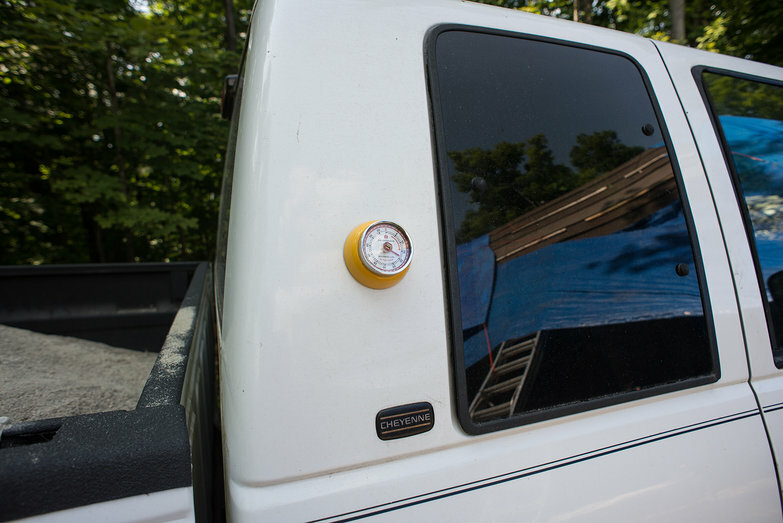 We're not sure if it will damage the pump to close the spigot while the it is running, and we don't want to be turning the generator on and off constantly. So, water gushes from our garden hose continuously. When we're done using it, we shove it into a large water container we purchased for just this purpose. Still, there is water everywhere, quickly turning our worksite into a mud pit. 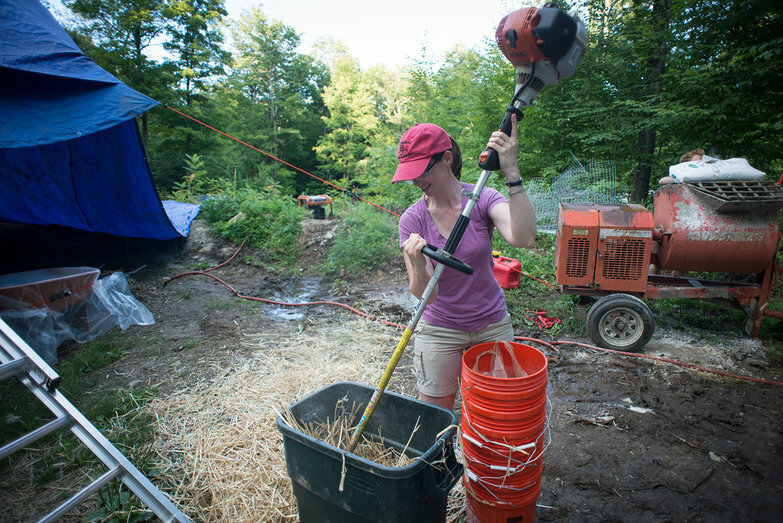 Next, we chop straw with a weed whacker so we can add it to the mix, too (for more tensile strength in the plaster). Is this really necessary? How finely do we chop the straw? Does this look right? We use my super cute kitchen timer to make sure we mix it long enough. 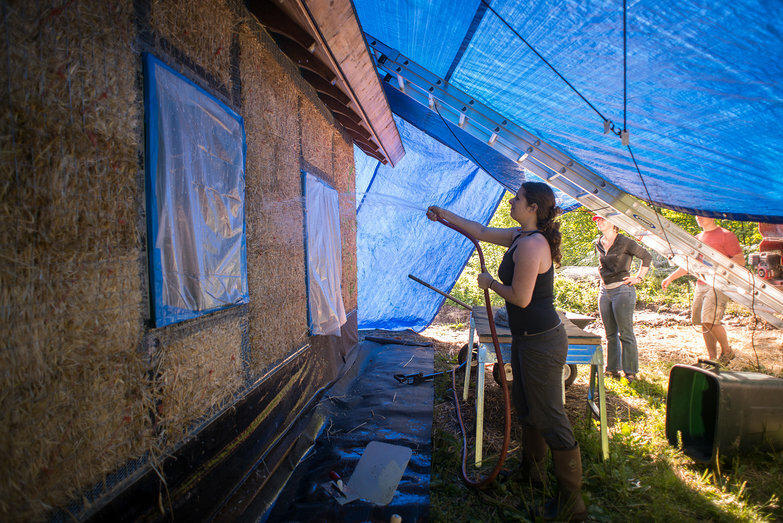 Before we can start, we have to wet down the bales, or we're told the moisture in the plaster will get instantly sucked out, and it will dry too quickly and crack (and when plaster cracks, that leads to leaks, and rotting bales, and the destruction of our house, and ultimately death, as explained above.) But oh my god, it feels so wrong to be wetting the bales down after all these months of trying to keep them dry!! AH! Our first batch is mixed. We nervously scrape it around on our hawks, trying to recall the minuscule half an hour of plastering we did at Linda's place. We swipe it onto the wetted straw. It promptly falls off. I'm pretty sure it's too wet. Should we just leave it outside until it dries out? Will that ruin it? I wish we knew what we were doing!! 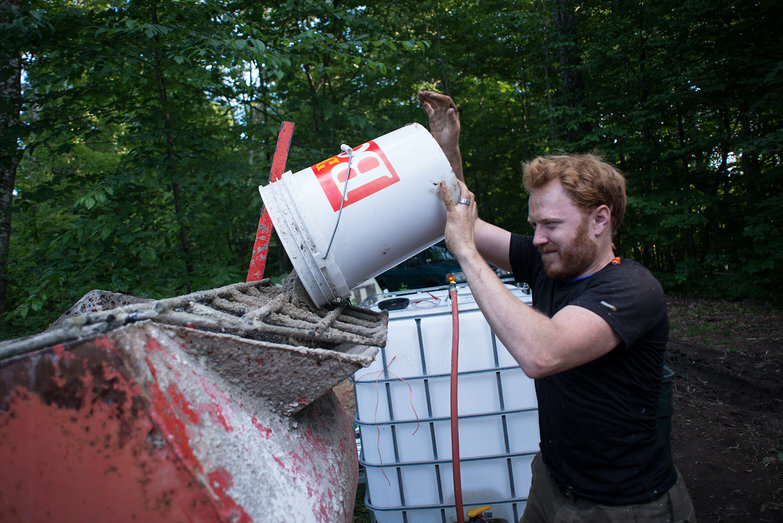 We mix another batch, and this time it is too dry, flaking off our wall in clumps. Could we mix both together since they're the same ratio of ingredients? I have no idea! Let's try it. It works, and we hit upon a good mix. It's the texture of whipped buttercream. It sticks to the walls like a dream. Thank heavens. After an hour or so, my nerves have calmed considerably. My arms are getting a workout, and my mood is improving with every stroke. With just this small amount of actual, hands-on experience, my knowledge of what makes a good plaster has increased by leaps and bounds. While I'm absolutely exhausted from preparing for this day, the reality of it is not so scary after all. For the first time, I am able to actually relax and be present with Kevin and Joy, who are visiting this weekend. We laugh and plaster companionably for hours, and I am thankful for their generous helping hands. Every now and again, I take a moment to stand back and look at our progress. Waves of relief wash over me. How good it feels to have these stupid bales covered up, out of sight out of mind, underneath a layer of concealing plaster. I can scarcely describe the pleasure this brings me. To know that they are safe. To have them transform from something distinctly un-house-like, to something smooth and beautiful. Goodbye, straw bales. Hello plaster. So exciting but so nerve wracking!!! What a great post! Do you have to do multiple layers of plaster? You guys remind me how important it is to do difficult things. Over the weekend, I hiked with my two boys, the youngest of which has severe autism. Though we didn't go far in terms of miles, I ended up carrying his fifty pounds and most of our gear (over 40% of my body weight) up to a high lookout on a narrow precarious trail, and then I carried him back down again. I won't even go into all the drama that occurred on the way, but suffice it to say it wasn't easy and considered turning around more than once. However, when it was over, it was all worth it. It's such a satisfying feeling to be able to say, "I did this." My older son, who had been complaining most of the way, later said it was one of his favorites days ever. Today as I write this, I'm very sore, but I don't mind one bit, because it reminds me what a great time we had, and I know it's good for me. I think what you're doing is kinda like that on a much grander scale. It may be hard to see the end of it, but you're getting closer all the time. When it's over, you'll survey the wonderful view of everything you've accomplished and feel an overwhelming sense of satisfaction. Hang in there, it's all worth it!